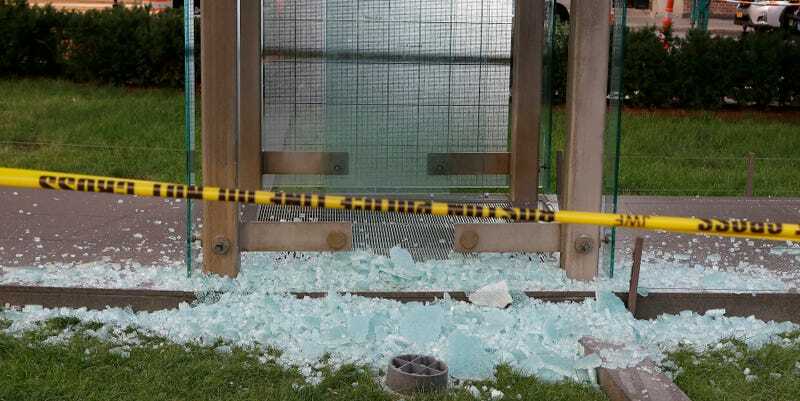 On Monday night, a 17-year-old threw a rock through Boston’s New England Holocaust Memorial, smashing a panel of glass. Bystanders wrestled the teen to the ground, staying there until police arrived. The Washington Post reports that the glass was engraved with numbers that represent the tattoos Nazis forced Jewish prisoners to wear in concentration camps, and was one side of one of the six towers in the square, each about 54 feet high. This is the second time the landmark has been vandalized this summer. A man named James Isaac smashed a panel in June, and pled not guilty to vandalism charges. The Post notes that the June attack was the first time the memorial had been vandalized since it opened in 1995. The memorial was reopened the same night as the incident, and the teen was charged with willful destruction of property. The Boston Globe reports they will be arraigned on Tuesday, and will be closed to the public because of their age. “The images of Nazis marching in the streets of America over the weekend in Charlottesville and now shattered glass once again at this sacred space in Boston are an affront to our Jewish community and to all those who stand-up against bigotry, hatred and anti-Semitism,” the statement said.